As a result of the housing bubble and resulting financial instability, many communities have a high rate of foreclosed homes. Even though the rate of new foreclosures is slowing, the number of foreclosed homes in a specific the market can make buyers leery of purchasing there — even if it seems like a really good deal. Conversely, savvy buyers can snap up some really great deals. The trick is to know where it is a good deal in a neighborhood poised for recovery, or where you might be risking your money. The house itself—since most foreclosed homes are empty and sold as-is, the cost of repairs to bring the home back up to its original condition can be costly. While empty, the home may have been looted or vandalized, had a leak or burst pipe, experienced mold or infestation by bugs or rodents. Liens—If the former owner owed money to contractors, utilities or taxes, the buyer may be responsible for paying those in order to have a clean and clear title to the house. Neighborhood instability—Make sure to check out crime rates, signs of gang activity, school ratings and other indicators of an unstable area. Homes in any neighborhood could be subject to foreclosure if the owner’s situation changed—business downturn, job loss, illness, injury, or death—so just the fact that it is a foreclosure is no reason to avoid a really good deal. Value—if neighborhood values are stable, and the foreclosed home is a financial deal in relation to comparable homes, then the foreclosed home should retain much of its value. When a higher percentage of the homes in a neighborhood are in foreclosure, all of the homes in that neighborhood will experience a decrease in their market value. As those homes are purchased, repaired and lived in, the entire neighborhood’s values will begin to appreciate. Affordability—It is in the bank’s best interest to unload foreclosed properties since the cost of maintenance and upkeep can eat away at any profit they may make. When there are more foreclosed homes in the neighborhood, the more quickly the bank will want to unload it, so you might get a really great deal. Community—Pay attention to the other homes in the community … the ones still lived in. If those owners are working at keeping up their homes, landscaping and general curb appeal, this may be the best indicator of whether or not to purchase in this area. In fact, if you and several friends all purchase in a high foreclosure area you can create that community yourselves. 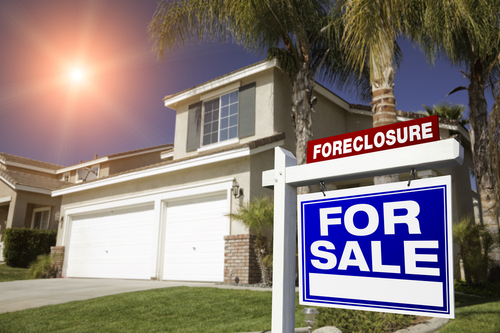 We can help you figure out if a specific foreclosed home is for you. We know neighborhoods, schools and community trends. We also know how many other homes in the neighborhood are on the market and the market value, and can help determine how anxious the bank is to unload the property. We’ll help you evaluate the risks and rewards available in the neighborhood. Most of all, we can help you navigate the ins and outs of liens, clear titles and bank qualifications. It is in all our interests to bring stability and appreciation to neighborhoods that have experienced a high number for foreclosures, so let us help you find the right home for you.